Office workers and computer users are not the only workers who sit for long hours and can suffer from health issues due to poor seating. A laboratory chair is generally found in scientific labs as well as any working environment requiring long hours spent looking through a microscope – basically, any medical and industrial environment that include forensics labs, hospital laboratories, and doctors offices. Most ergonomic laboratory seating is made of durable and easily cleaned material that is not as nice-looking as desk and computer chairs but easier to maintain, which is important wherever spills can frequently happen. The main difference between ergonomic laboratory chairs versus office chairs is taller height, added footrests, and no armrests. The important seat pans are usually shaped to tilt the pelvis forward, creating correct lower spine positioning when seated, even when leaning forward looking into a microscope. Many ergonomic lab chairs include a forward tilting seat pan to help be closer to work without hunching or physically leaning forward. Ergonomic chairs in the laboratory must help a user roll and swivel freely, allowing for complete movement unimpeded by armrests. 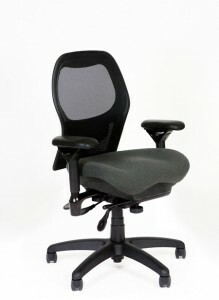 Back supports are usually smaller than most computer chairs and seat coverings are usually vinyl or other durable, non-absorbing material that is easy to clean and contaminant-free. Back problems are very common for users who spend many daily working hours looking into microscopes or preparing specimens, often bending or leaning over a workstation. Correctly adjusted laboratory ergonomic seating does help considerably. Users can alleviate bending over a work area since the seat is a much better height, allows closer positioning to the work area, and provides being able to get closer to a work area while maintaining the correct pelvis angle. With a good ergonomic lab chair, effort-free movement and proper seating posture can be achieved, allowing for work with reduced fatigue and few health-related issued. There are many different types of ergonomic chairs made for the laboratory that play an important role for lab and medical workers; workers can perform job duties without bending or leaning. When the back is protected, workers are more productive and healthier, which is important in jobs requiring such precision. Although this type of laboratory seating is more expensive than a simple lab stool, the increased benefits from using an ergonomic laboratory chair should be considered as an investment in productivity and employee health! Find Superior Laboratory Ergonomic Seating With the Help of the Ergonomic Chairs Store! Does your office or lab have the proper ergonomic chairs to keep employees free from back pain? Call the Ergonomic Chairs Store at 979-217-3044 to learn how a chair’s design can improve productivity!